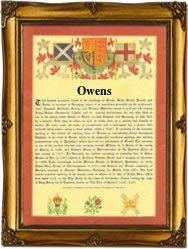 Recorded as Owens and occasionally Owenson, this is a Royal Welsh surname, being, it is claimed, descent from the ancient tribes of North Wales. It is a patronymic of Owen, which is derived either from the ancient Celtic personal name Owain, adapted from the Latin "Eugenius", meaning "well-born", or from the Old Welsh word "oen", meaning the lamb. Given the warrior status of the clan, this seems an unlikely explanation. Owain or Owen has long been one of the most popular of all Welsh personal names, and some thirty-nine Owains are featured in ancient Welsh legends. Hereditary surnames were a later adoption in Wales than almost any other European country, not becoming 'fixed' until the 17th century/ Examples of the name recording include Owen Gwynedd, a 12th Century chieftain, and Owen Glendower (Owain Glyndwr), 1353 - 1416, the greatest hero of Welsh history. He was the Prince of Wales who established the Welsh parliaments and nearly became an independent king of Wales, but was defeated by Henry 1V of England. The personal name was first recorded in England in 926, in the Anglo-Saxon Chronicles, as "Uwen", and the much later coat of arms has the unusual blazon of a red field, charged with six gold pineapples. The first recorded spelling of the family name in any form may be that of Ralph Owein. This was dated 1221, in the Assize Rolls of Warwickshire", during the reign of King Henry 111rd of England, 1216 - 1272. Throughout the centuries, surnames in every country have continued to "develop" often leading to astonishing variants of the original spelling.